Today Picasa Web Albums has the most important update since its launch, in June 2006. Basically, it adds the most requested features and even some obscure features that will make you very happy. First, the free version of Picasa Web gets 1 GB of storage (up from 250 MB), enough to host 4000 high-quality photos. It's interesting that Google says "1 GB (and counting)" so the storage could increase like it does in Gmail. Like in Flickr, you can also search the public photos posted by other people. Until today, you could search only your photos and the public photos uploaded by your contacts. Google wanted to be polite and ask you before including your public photos in the community search, so you must go to settings and enable this. I told you last year that the new Blogger uses Picasa Web Albums to store photos. Now you automatically get new albums that store all the photos uploaded to your Blogger blogs. This is a nice way to view and search all the photos uploaded to your blogs, but also to backup your photos. For more context about a photo, click on the link to the post that includes it. Here's the album for Google Operating System. It's also easier to link to a photo and you have more options when you embed a photo into your site. If you want even more options regarding the size of the embedded photo, check this post that lists all the available photo sizes. Interesting. That means the limitations for uploading photos to Blogger are the same as Picasa Web's limitations. But in Picasa Web you can have only 500 photos per album. Does this mean I can only upload 500 photos to a blog? "Any photos that you post to Blogger are included in your Picasa Web Albums storage quota. The number of Blogger photos you can upload is determined by your web albums storage level." From this text, I understand you can upload more than 500 photos in Blogger. Try again later. The site is pretty slow and there's a noticeable lag when you do a global search. That album is public, so you should see it even without a Google account. I'm pretty sure that at some point in the past you couldn't embed a Picasa Web photo in a message board (phpBB or ezBoard, for instance). I don't know if the latest update changed this, or if this was available before, but you can do it now. Just get the url to the jpg out of the full html code in Picasa Web, then use that url in your message board. As I said, maybe this was available before this latest update, but I know it wasn't at one point. This is GREAT news and all, but how about some love for the Linux users out there! We haven't been able to use WebAlbums (reliably) since it was released! How about support for Mac OS? There is a Picasa plugin for iPhoto. You can export directly to Picasa Web Albums. Go get it! I absolutely LOVE the Picasa software (I haven't opened Photoshop for personal photos in ages) and the Picasa Web Albums is a nice service. But is it just me or is the one thing Google seems to have a hard time getting a good feel for is personalization and social networking? Sure they bought YouTube, but they didn't build it or its user-base; nor have they really had it long enough to leave their mark on it. Blogger is arguably the best product in their line-up where they finally appear to be getting a better feel for this aspect. The interface and integration with Picasa (and now Blogger) is very nice. But IMO it just doesn't seem to encourage social interaction or browsing through networks of friends, groups, tags, etc. Like a lot of Google products, it just comes across as rather cold and clinical. Functional? Absolutely - just like most Google products. But fun or personable (which is more important for things like photos and video v/s maps and email)?? I guess that's a matter of opinion, but I just don't get that vibe from it yet. My first question about the increased space was "hey, what about those of us that paid?". Well, I paid for 6 gigs and it's now showing 7144 MB. I can't tell if the 6gig plan is no longer offered, but the paid tiers now look to be 25GB ($100 USD per year, 100GB ($300 USD per year), 250GB ($500 USD per year). I wonder if paid space will grow too? And I'd really like Google to share all my space (web, picasa, gmail) and let me use it how I want. I wonder what the impact will be long term with google offering all these free services, that can out existing paid offerings. I mean for sure it's good short term, but what happens when no one else can compete with google or innovate. There are lots of companies who compete in the image hosting industry with all kinds of different business models. I just hope flickr or picasa don't kill the little guys. I saw this last night, real late. It's a great improvement. That is great, although I did pay for 25 gb. Picasa works well with my Macs. I compared Flickr to Picasa and prefer Picasa. 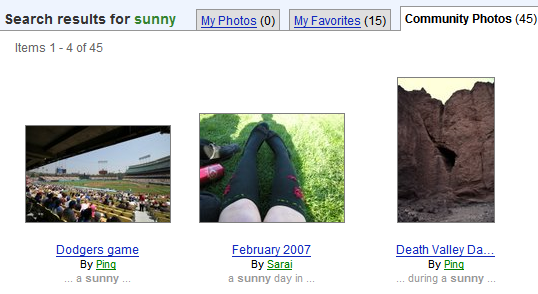 Flickr uploads my images in a random order, and Picasa gets the sequence right--very important to me. Flickr has too much junk everywhere, Picasa is much cleaner looking. I am not into public albums, so that whole thing is not a consideration. Very interesting news. I am a user from Germany and can only see localized contents. So I obviously don't have access to some of the new features: I can't even see the search field. Does anyone know how I can search albums using an IP address located in Germany? As usually with Google (and other sites), to see the latest features, don't use the localized version. It's easy to switch to the English version. Go to Picasa Web, click on Settings and change the language to English (United States). To search all the photos, click on the arrow next the search box and select "Community Photos". Do photos from older blogger posts show up in picasa, I haven't seen it happen for me yet, or is there a setting that needs to be fiddled with? Also, no photos I've posted as recent as today have shown up in picasa, I'm wondering if it's because I post all the photos on-the-go via a cameraphone, anybody know? What I'm trying to do is (I think) the flipside to this article. I have a blogger account, and I would like to include a rnadom selection of thumbnails of my picasa web images within a block of my blog (similar to how is already done with flickr images on a lot of blogs). Anyone with any input on this? if i email someone an invitation to look at my new album can they access my mail once they have opened the public gallery? If you send an EMAIL invitation directly from Picasa Web, that email will be from your email address. So he can reply to your message or save the address to the contacts list. The public gallery is like this blog or any other web page: you can't edit unless you have a proper account. So if your contact doesn't have your Google Account password, he can't edit your gallery or access your email. Do I use Picasa Web Albums? Heck yeah! It's great. I'm already editing my photos in Picasa anyway so it's just one more click to effortlessly upload them to an album to share with family and friends. I used to use a Gallery2 to have an embedded photo album on my website but now I let Google take care server space, bandwidth, and server maintenance. Sure I wish I could embed the whole album within my website but I got around that by embedding thumbnails links to each individual album. I cant beleive i am the only one who is having this issue with picasa. I have made a great album and put it on the web and edited the index.html page to my tastes. Now I want to add some more photos and i cant because it overwrites my edited index.html page. I embedded the Picasa Web Album Slide Show in my Blogger page... but I only want it to show my images as a slideshow there... I don't want the viewer to be able to double click on the slide show and be able to go do my Web Album itself. How can I stoop them doing that? Most likely, you didn't link to your photos from any web page. There's an option called "link to this photo" next to each of your photos. Can you moderate comments in this blog? You can't do that in Picasa Web Albums; that's just stupid. Is Picasa planning on adding comment moderation soon? This is going to be real critical thing and I'd like to have an idea as to when this will possibly be online. I'm on a mac using Picasa Web Albums. How do I get the "From" area in my email to show my name instead of being From "Picasa Web Albums?" I don't have a "Tools" or "Options" menu anywhere. I believe Windows does. Is there an update on the web albums again because it is very very slow the last few days. I too feel web album very very slow nowadays. Is it possible to know who is looking at my pictures (IP address)....Can I track the id of the viewer of my picassa album photos?? No, Picasa Web Albums doesn't have this feature. How can I change the default album? I have almost 1000 picture in the old one with the default name for my blog and I'd like to start a new one.